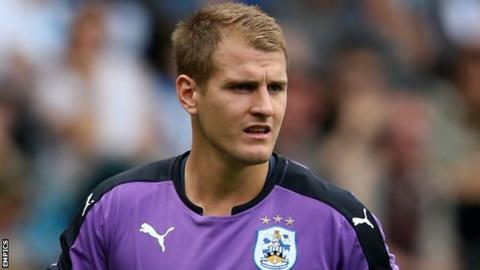 Huddersfield Town manager Chris Powell says the Championship club could sell goalkeeper Alex Smithies if they receive the right offer. The 25-year-old has played more than 270 times for Town but Powell says the club would consider selling him. "He's a good goalkeeper, I've always planned for him to be here but things happen," Powell told BBC Radio Leeds. "If people pick up the phone and make offers that, as a football club we can't turn down, then things change." Smithies, a product of the Huddersfield Town academy, was involved in Huddersfield's opening day defeat at Hull but has not featured in either of their last two games, with Joe Murphy starting in goal. "We know that virtually every player has a price and he is someone who I've always looked at being a mainstay, but things change - players don't stay forever," Powell added. "If Alex is here, I'll be happy. If he's not here then I'll be the first one to shake his hand and say thank you for all that you've done for me." "One of the reasons I've always liked Joe since I've been here is that he's a good goalkeeper. Goalkeepers want a run and if it happens [Smithies leaves], then Joe will have to get that run."